Twice a year we all go on a trip and bring all of our ideas and inspirations and talk about design ideas for a few days. The atmosphere is very creative with lots of drawing and sketching. You can see the actual process in our Hardcover Book “Anita Goodesign through the years” This new Grecian Garden collection was designed at our latest retreat. We’ve always loved the embossed details on pottery and cameos, especially Wedgwood pottery. The stark contrast of the white on blue is always striking. There are 20 main designs and they each come in 2 sizes, there are also 13 isolated smaller designs. 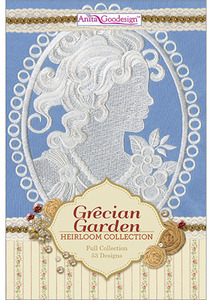 The collection has everything from cameos, to flowers, leaves, grapes and classic Greek designs. The designs will look elegant and lovely on whatever you stitch them on. 53 Designs Total – for the 5”x 5”, 6”x 10”, and 8”x 12” hoops.